The opportunity to change lives using blockchain technology. At INVESTA our vision is of a future where Blockchain technology will provide Advancement and well being through technology. 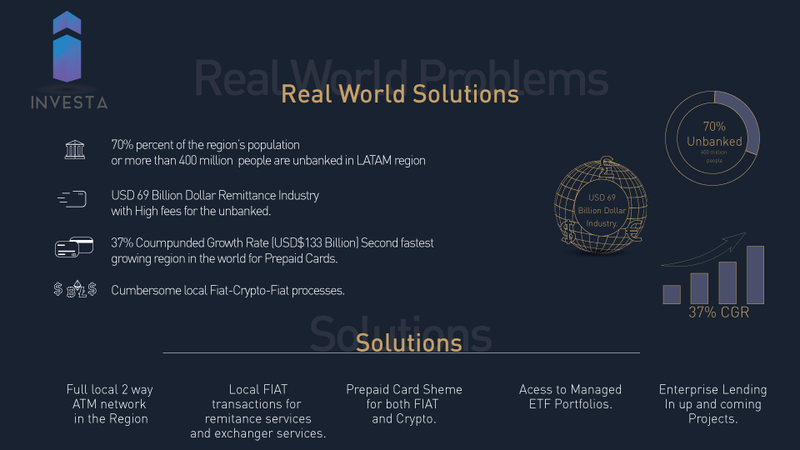 Amongst many uses companies and entrepreneurs alike give to Blockchain Technology, one that we at INVESTA are committed to bring to fruition is the expensive remittance services in the Latin American Region. This affects a special part of the population comprised of migrants spread around the American continent. The remittances sent on 2015 rose to the highest level in at least 15 years. This brought a total amount of $68.3 billion that migrants transferred higher than a pre-recession peak of $64.5 billion in 2008. “Family remittances to 17 Latin American Countries grew over 8% from 2016 to 2017, reaching Over $75Billion. This increase far exceeds the World’s Bank forecasted 1.2% economic growth for the entire region. In terms of Scale, remittance growth has been nearly as large as export growth 9% in 2017” (Manuel Orozco-2017 -The Dialogue Leadership for the Americas). Using the potential sanctions and higher risk associated with abusing the banking system for money laundering major international banks continue to pose a major challenge to the provision of remittance services. Complaining that remittance transactions are prone to the risk of money laundering and other financial crimes, banks have been closing the correspondent banking accounts of many money-transfer operators (MTOs). Remittance service providers and banks need not only to apply “know-your-customer” (KYC) regulations, they also need to know their customer’s customer. According to the World Bank’s survey on this phenomenon in the G20 countries, MTO account closures by banks was widespread. This situation has continued this year, in which banks are closing the bank accounts of MTOs. A risk-based approach is what the Guidance on financial inclusion of the Financial Access Task Force (FATF) recommends when dealing with AML/CFT systems. Nevertheless, several financial institutions do not want to take any risk and prefer to close the accounts of money transfer operators (MTOs). To add to this issue, a great amount of remittance users are, in the most part, either unbanked or underbanked with little to no banking services provided to them due to their legal situation in their respective countries. this forces people to incur in additional expenses in the form of fees that certain MTOs offer which are in many cases higher than a regular international bank to bank wire transfer. As a simple example a Venezuelan migrant in Chile, that had to flee his country looking for better opportunities. Has absolutely no banking services available to him for the first year until he can successfully apply for a visa, and even then the banking services he can obtain are quite limited for the next 5 years until he can get full residency. During that time this Venezuelan worker would have only the alternative to use one of the many MTOs. Which for their service will charge a fee that ranges from 5% all the way to 18% if we factor the spread difference of the exchange rate. 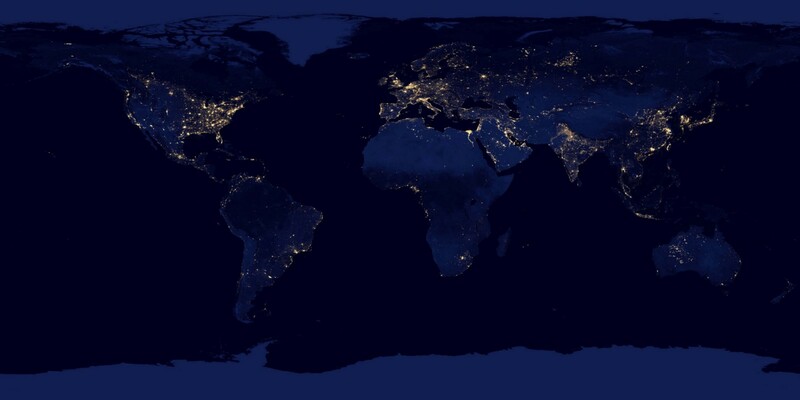 The establishment of Blockchain digital payment systems for remittances instead of using regular cash MTOs for these types of transactions are of enormous benefit to the poor in developing countries. Through its ITM Network in conjunction with its proprietary REALM Platform INVESTA is setting a network across the region and some European countries which provide transparency, safety and reliability safeguards. interoperability of bank and nonbank financial service providers so different types of systems work with each other, adequate physical infrastructure to offer digital payments, availability of cash-out points, stability of prices, and sequencing in the adoption of digital payments and mobile money. Several attempts to solve most of the issues have been approached by different companies from many sectors of the industry. Most of them with innovative solutions, others in conjunction with banking related products. But what INVESTA proposes is to solve this issue taking what already works and making it better, faster, easier and above all safer. All with the use of our Inter Numerical Valuechain. (INV) as the vehicle for transparency, security and efficiency.